In September, 2009, HeartSpace Spiritual Resources (HSSR) was honored to receive Czech Memorial Scrolls Trust (MST) Torah #1118, one of numerous Torah scrolls stored in the Pinkas Synagogue in Prague during World War II. 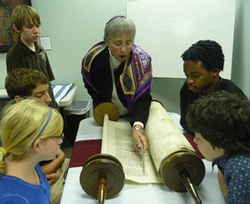 HeartSpace offers formal presentations with Memorial Scrolls Trust Holocaust Torah #1118, providing an opportunity to explore sacred text, to understand more about Jewish practice, and to learn about the history of these Czech Jewish religious artifacts during and after WW II. If you would like to schedule an opportunity to experience and explore the sacred text of Torah and to learn about the history of the Czech Torahs, please email: HSSR.info@gmail.com or call 919-906-2399.